NASA's Aqua satellite passed over the Eastern Pacific Ocean's Hurricane Fernanda as it continued to track toward the Central Pacific. The storm continues to move over cooler waters and is on a weakening trend. The storm's eye is now cloud-filled. July 18, 2017: On July 17 at 6:10 p.m. EDT (2210 UTC) the Moderate Resolution Imaging Spectroradiometer or MODIS instrument aboard NASA's Aqua satellite provided a visible picture of Fernanda. The image revealed strong thunderstorms continued to circle the low-level center of circulation, and the eye of the storm had become filled in from clouds. 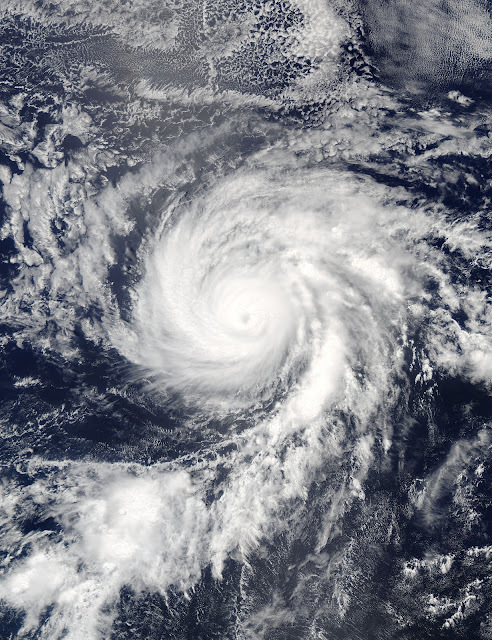 At 5 a.m. EDT (0900 UTC), the center of Hurricane Fernanda was located near 15.4 degrees north latitude and 132.8 degrees west longitude. That's about 1,495 miles (2,410 km) east of Hilo, Hawaii. Fernanda was moving toward the northwest near 9 mph (15 kph) and this general motion is expected during the next day or so. A turn to the west-northwest is expected on Wednesday. The estimated minimum central pressure is 971 millibars. Maximum sustained winds are near 105 mph (165 kph) with higher gusts. Continued gradual weakening is forecast during the next couple of days.